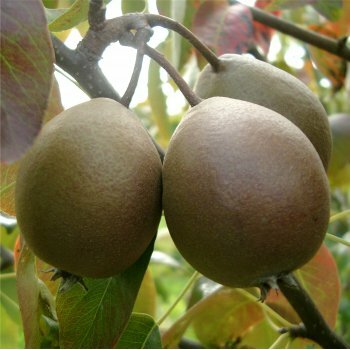 Black Worcester is a very good cooking pear with dark-green skin that is covered with a brown russet. The pears are almost spherical rather than the typical teardrop shape that we have come to expect from these fruits. Pear Black Worcester comes into its own when cooked as the flavours are intensified. This 16th century pear is seen on the Worcestershire coat of arms. Pretty white spring flowers require pollination by any other variety in group A, B or C.
Black Worcester requires a suitable pollination partner. Pear trees should be spaced according to their rootstock, for example a Quince A (semi-vigorous) rootstock will require approx. 3 metres between trees, whereas a Quince C (dwarf) rootstock will require approx. 2 metres between trees. Quince A (semi-vigorous): 3-3.5 metres (10-11.5 feet) in 10 years - ideal for smaller orchards, individual specimens and espalier training. Quince C (dwarf): 2 metres (6.5 feet) in 10 years - ideal for smaller gardens as specimen trees and suited to cordon training.